We have a variety of pet headstones and pet grave markers including dog headstones, cat headstones, upright pet monuments and natural rock pet gravestones. Pet loss, for many, has been equated to human loss. 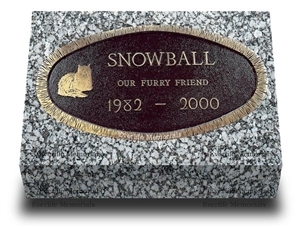 To that end pet parents feel it is appropriate to honor their beloved pet’s memory with a traditional pet grave marker. Like headstones for people, grave markers for cats and dog headstones are used to mark a pet’s resting place in a pet cemetery or serve as a memorial in one’s garden. Store your pet's ashes inside these cremation markers. Our experience in providing headstones and grave markers for humans with an eye for service reflects in our pet headstone line of products. As always, our commitment is to you the customer. From providing you with a secure purchasing experience to answering your every question, our service team will be there for you throughout your pet grave marker purchase. Whether you know what kind of pet headstone you are looking for or don't know what you want, we have many different styles to choose from. 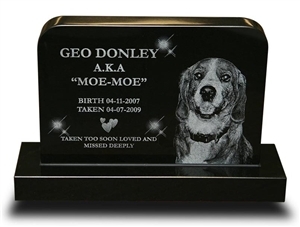 Laser engraved pet headstones are made using a highly polished black granite pet marker in which your beloved cat or dog's image is laser engraved onto the surface with a name, dates and additional lettering. These wonderful pet headstones are the most popular line of pet grave headstones we offer. 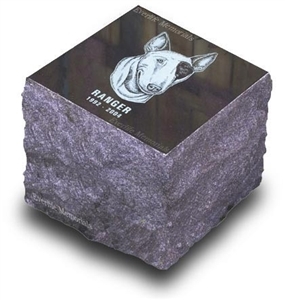 Upright pet monuments are also very popular and are made using the same black granite with a laser engraved image of your pet on the face of the granite tablet. The upright tablet is securely mounted to a black granite base and makes a beautiful pet memorial. These cat and dog monuments are shipped as one piece. Bronze pet grave markers are cast bronze plaques which can be made with an emblem of your dog's specific breed or an image of a cat. The bronze plaque is secured to a durable granite base and will last for many years to come. 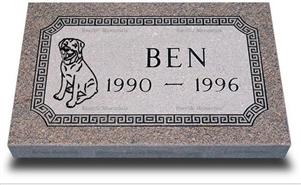 Sandblasted pet cemetery markers are made in the traditional way the grave markers are made for people. Utilizing the method of sandblasting which engraves the lettering and design into the surface of the granite marker, these handsome pet cemetery markers are popular in many pet cemeteries. Natural pet gravestones utilize naturally shaped stone and are carved with a silhouette of a specific dog breed or cat along with the pet's name and dates by means of sandblasting. They blend in well in a garden as they retain that natural look that many desire. Pet cremation markers are yet another type of pet headstone in which the cremated ashes of your dog or cat can be store inside a special compartment within the memorial. We offer two styles of pet grave markers which can be laser engraved with either standard artwork or a supplied photo of your pet. Questions About Cat & Dog Headstones? We assure you that our main interest is in ensuring that your entire experience in purchasing a pet headstone is a satisfying one. Other popular search terms: dog headstones, dog grave markers, grave markers for dogs, headstones for dogs, cat headstones, cat grave markers, pet grave headstones.